Update, March 28, 2019: More than a year after Escondido, California-based Stone Brewing announced it was suing Keystone beer producer MillerCoors over the Stone trademark, the court has issued an order on Stone’s initial suit. 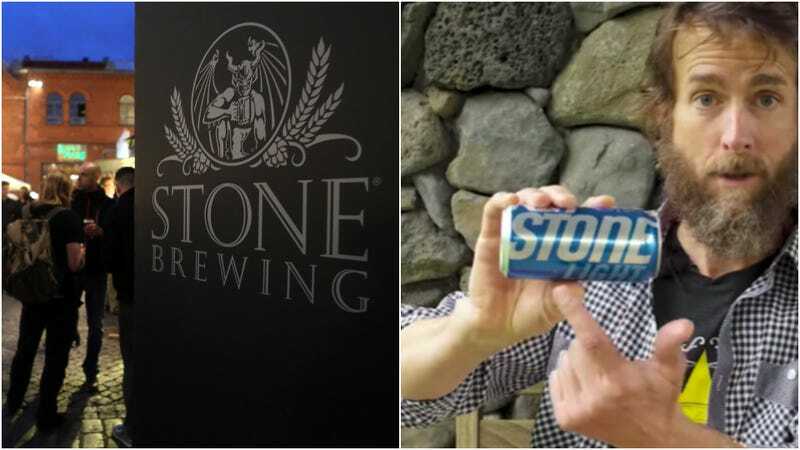 In a press release shared by craftbeer.com, Stone says the Court found that “Stone’s trademark infringement claim against Miller is moderately strong.” This means the lawsuit can move forward, potentially resulting in an actual trial. Original story, February 13, 2018: To anyone who’s drank beer before, Keystone—light, fizzy, watery—is worlds away from the beers put out by craft brewery Stone Brewing. Those are hoppy, aggressive, and definitely not the kind of stuff I was playing flip-cup with in college. But California-based Stone Brewing announced yesterday that it is suing MillerCoors, which owns Keystone, over the Stone trademark. It’s a rare moment of public drama between one of the country’s largest breweries—MillerCoors—and Stone Brewing, one of craft beer’s elder statesmen. The lawsuit came about because Keystone has recently separated the “Key” part of its name from the “Stone” portion in certain advertising and packaging, which Stone Brewing claims infringes on its trademark. To win the lawsuit, Stone will have to prove that there’s a likelihood of consumer confusion between their trademark and MillerCoors’ Keystone beer. Stone co-founder and executive chairman Greg Koch announced the lawsuit in a video posted on Twitter yesterday in which he paints Stone as a David taking on the MillerCoors “Big Beer” Goliath. But Stone has its own considerable resources; it’s a nationally distributed brand that’s among the 10 largest craft breweries in the country. In response, MillerCoors asserts that Keystone is the older brand, and it dismisses Stone’s lawsuit as a publicity stunt. No matter which side you’re on, the lawsuit is highly unusual. “I can’t think of another case where there’s been a large craft brewery on one side and one of the mega breweries on the other side ... This is Stone Brewing and Keystone, both of which are enormous brands,” Brendan Palfreyman, partner in the law firm Harris Beach and an expert in beer trademark law tells The Takeout. Unlike the vast majority of beer trademark disputes which are settled verbally and without legal action, Palfreyman says this case has the potential to go through a full court proceeding. In the 9th Circuit Court, where this case will be heard, Palfreyman says there’s a seven- or eight-factor test that will be used to determine whether MillerCoors has infringed on Stone’s trademark. Namely, he says, the case will evaluate how close the two marks or brands are, and how close their two goods are. “A lot of it’s going to boil down to whether there are instances of MillerCoors using the term Stone by itself. The flip side of that coin, if there are instances where they’re using [the full name] Keystone, that’s a weakness for Stone’s case,” he tells The Takeout. Toward the finale of his video announcing the suit, Stone co-founder Greg Koch takes a parting shot at Keystone: “I don’t think I’ve ever held a Keystone in my hand before and I can tell you I’ve certainly never even tried one before.” Then he spits out the Keystone in a gross stream, much like I did after 14 rounds of dorm-room flip-cup.